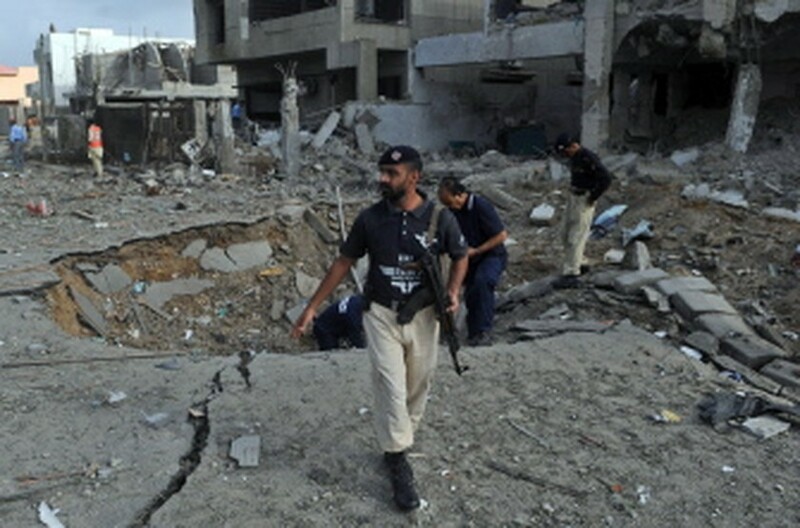 A car-borne Taliban suicide bomber flattened the house of a senior counter-terrorism police officer in Pakistan's financial capital Karachi on Monday, killing eight people including six policemen. Senior Superintendent Aslam Khan, who was unhurt in the attack but whose home was destroyed, told AFP he had been threatened by the Al-Qaeda-allied Pakistani Taliban and knew that he was the target. The Islamist militant group claimed responsibility for the attack and said Khan had been targeted for arresting, torturing and killing Taliban members. "It was a car bomb attack on my house," he said. "I was receiving threats from Tehreek-e-Taliban (TTP). Taliban are involved in this attack." Several neighbouring houses were also wrecked in the attack, an AFP reporter saw, with four cars being badly damaged and a two-metre (six-foot) deep crater left in front of Khan's home. "Eight people including six policemen have been killed and several others were wounded," Shoukat Hussain, another senior police officer, told AFP. "A child and a woman were also killed. It was a car suicide attack." Speaking to reporters outside the remains of his one-storey bungalow, Khan said: "I woke up from sleep and saw fire around. I ran towards the other rooms of the house and saw my family safe but bewildered. "This was a cowardly act of Taliban. I am not scared of Taliban. Let me tell you that I will not spare them in future." Karachi city police chief Saud Mirza confirmed that Khan had received TTP threats, including one recent written threat. "We claim responsibility for the attack. Aslam Khan has killed a number of our colleagues and also arrested and tortured many more," TTP spokesman Ehsanullah Ehsan told AFP in a phone call from an undisclosed location. "He was on our hit list and he is still on our hit list," Ehsan said, giving names of several other police and crime investigation department officials also targeted. "They will be killed soon," he vowed. "I went across a lane and saw this house destroyed and huge flames around it," said Shaikh, who lives in the area. He saw the bodies of a boy, later identified as a second-year school pupil (aged eight or nine), and his mother lying near the house. "The boy's schoolbag was lying abandoned nearby," Shaikh said, choking. Nearly 4,700 people have been killed across Pakistan in attacks blamed on Taliban and Al-Qaeda-linked networks based in the country's northwestern tribal belt since government troops stormed a radical mosque in Islamabad in 2007. On Thursday, a bomber killed 46 people when he blew himself up in a crowd of mourners as they gathered for prayers in the northwestern town of Jandol, 100 kilometres (60 miles) from the once Taliban-infested Swat Valley. Karachi, Pakistan's economic hub, is currently undergoing its worst ethnic- and politically-linked unrest in 16 years, with more than 100 people killed in one week alone last month. The nationally ruling Pakistan People's Party, which was elected in 2008 after nine years of military rule, insists that civilian authorities are capable of controlling the bloodshed, despite calls for military intervention.